The load, though, is a lot lighter after beating the rival Green Bay Packers 24-17 on Sunday night. The complete performance, though not without blemishes, was especially rewarding given the way the Vikings played at Chicago on Nov. 18 in the 25-20 defeat that gave the Bears a firm hold on the NFC North . The Vikings (6-4-1), who trail in the division race by 1½ games and finish the season with a rematch against the Bears at home on Dec. 30, moved into the first NFC wild-card spot. The problem is there are four teams tied at 6-5, with one of those slots to go to the NFC East winner. With the difficulty of these next two games, the Vikings could very well fall below the cut and have to win their way back in over the last three weeks. If they can collectively play as well against the Patriots and Seahawks as they did against the depleted Packers, though, they’ll give themselves a good chance to stay on a winning streak. The defense will be tested anew by Brady, but Zimmer said the hamstring injury suffered by cornerback Xavier Rhodes was “very, very mild,” an encouraging development for the pass coverage. The offense, of course, was under the most pressure after that dud against the Bears and their fierce defense. 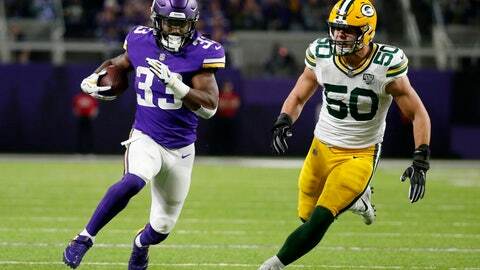 Dalvin Cook made more of an impact, scoring his first touchdown of the season on the kind of basic screen pass that has been largely missing from the game plan. Offensive coordinator John DeFilippo sent more running plays to the perimeter, where there was more space to operate. The blockers up front had one of their best games of the year in protecting Kirk Cousins, who came through with three touchdown passes without a turnover. Cousins showed more willingness to run with the ball, too, on the handful of occasions the pocket collapsed and nobody was open. Zimmer encouraged him to do so in a wide-ranging conversation last week, after Cousins threw two interceptions against the Bears in a performance that was his worst with the Vikings.